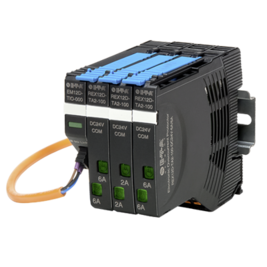 E-T-A provides the ideal solution for machine and panel builders with an intelligent protection system comprising the REX12D circuit protector and the EM12D interface module for connection to IO link. The system combines the well-proven quality of DC24V overcurrent protection with the communication options of the IO link system. It transmits the status information and present current values of the up to 16 REX12D-TA2 devices to the superordinate control unit. It allows complete transparency of the DC24V power supply and provides all necessary information for a reliable production process in this plant sector.